Preview images for the Arrow episode "Fighting Fire With Fire"
VIGILANTE ATTACKS MAYOR QUEEN — Oliver (Stephen Amell) faces his biggest challenge yet as mayor. Felicity (Emily Bett Rickards) continues down her dark path with Helix. After Vigilante attacks Oliver while he’s acting as the mayor, Diggle (David Ramsey) leads the team in a mission to stop Vigilante once and for all. Michael Schultz directed the episode written by Speed Weed & Ben Sokolowski (#515). Original airdate 3/1/2017. The gallery, which seems to include most if not all of the Arrow cast, can be found below. Enjoy! 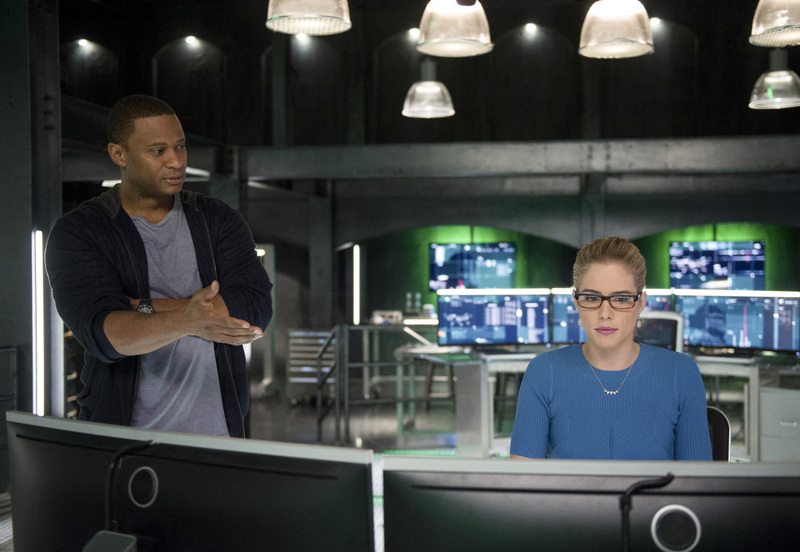 Arrow -- "Fighting Fire With Fire" -- Image AR515a_0040b.jpg -- Pictured (L-R): David Ramsey as John Diggle and Emily Bett Rickards as Felicity Smoak -- Photo: Diyah Pera/The CW -- ÃÂ© 2017 The CW Network, LLC. All Rights Reserved.